It's brand new and never played. I've listed it on eBay, but I'm in the US so shipping might be prohibitively expensive if you're not in North America (sorry). 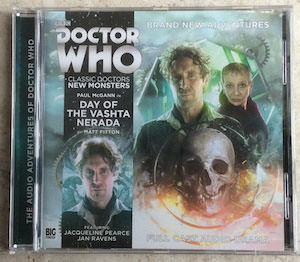 Alternately, I'd do an even swap worldwide for the Big Finish B7 Heroes anthology, so long as I don't yet have any eBay bidders ('cos it's a jerk move when something becomes 'unavailable' after you've bid, amirite?). You might get a better price if you sell them as a box set. I presume you bought them direct from Big Finish? What I usually do is rip them and sell the discs on if I have bought from eBay or other website and when they come up for sale at Big Finish buy the downloads. You might get a better price if you sell them as a box set. Which I'm not doing because I'm keeping the Fourth Doctor story. And I'm probably not the only person out there only interested in certain stories rather than the whole set.